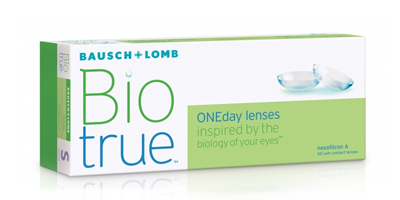 BiotrueONEday lenses are the latest lenses developed by Bausch and Lomb. 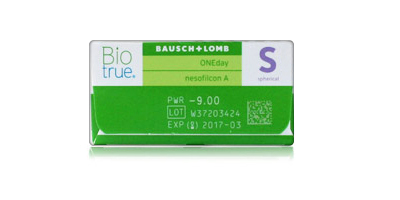 They are the only daily disposable lenses with a revolutionary HyperGelmaterial that gives you comfortable vision throughout the day. The water content of these lenses is extremely high and matches the cornea's own water content to give the wearer a very comfortable wearing experience for up to 16 hours. Meets oxygen levels the open eye needs to maintain healthy, white eyes. Matches the cornea's water content (78%) to support incredible comfort. 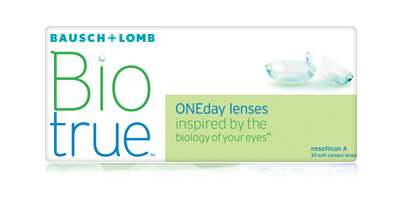 Mimics the lipid layer of the tear film to retain moisture and shape for comfortable vision throughout the day. High Definition Optics - reduces halos and glare, especially in low light.